I’m done with my big 2016 trips, so back to 1988. I am kind of embarrassed to admit that I wasn’t really into history at this point in my life, so the thing that is causing me to stop and research rather than writing didn’t even register to me back then. Christ Church is the church that a number of prominent Philadelphians, including Benjamin Franklin, Betsy Ross, George Washington (once he was president), John Adams (likewise), and William Penn all worshiped here. One problem, though. Ross and Penn were Quakers. So here I am, trying to figure out why a bunch of Quakers were worshiping in an Anglican church. So far, I’ve been able to determine that Betsy Ross’s husband, John, was Anglican, and so she got expelled from the Quakers for marrying a non-Quaker. During the American Revolution, the Quaker meeting in Philadelphia splintered into two groups, one that believed that sticking to their pacifism was important, and one that believed that the revolution was a just war and that they had a duty to support it. Betsy was able to join this second group of Quakers, who dubbed themselves the Free Quakers. William Penn is the real poser, though. He founded Pennsylvania because he was a Quaker. Quakers were outlawed in England and so he found Pennsylvania to be a place where Quakers would be free to practice their religion. So then he moved here and promptly started attending an Anglican church? It just doesn’t add up. Maybe the Quakers met at Christ Church (the Arch Street Friends meetinghouse wasn’t built until 1804)? I have a coworker who’s from Pennsylvania. Maybe she knows. I’ll try to remember to ask her. So I did ask my coworker and she didn’t know that William Penn had attended an Anglican church, so that’s a dead end. I guess we’ll just have to leave that as a head-scratcher. If I ever do find an answer, I’ll let y’all know. After we left the church, we wandered around in the Burial Ground for a while. The website for the church says that there are currently 1,400 markers and that over 5,000 have disappeared. So this little burial ground, just two acres in area, contains over 6,000 graves. Next up: Fairmount Park, Baltimore’s Inner Harbor, and the realization that I need to dig out that photo album and rescan the final five pictures. 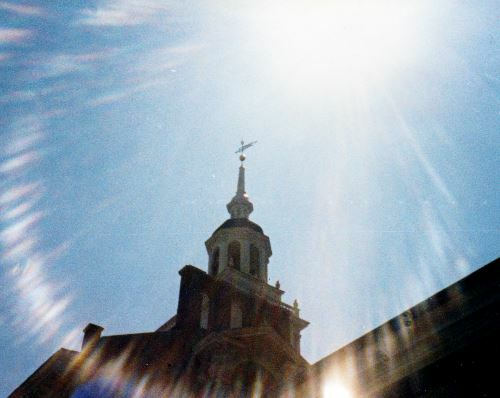 I started writing this, thinking that Independence Hall would have been our first stop once we got our bearings, but apparently we went to Christ Church first. I considered bumping this back and running Christ Church first, but that puts this post as launching after we get back from Utah/Montana/Wyoming/Colorado, and I really need to queue up the posts for when we’re gone first. By the way, assuming that our flight out goes as planned, as you read this, Alex and I are in a rental car driving from our hotel in Montana to Dinosaur National Monument. Alex and I didn’t get to Independence Hall in 2015. After the debacle of getting to Rome in 2014 caused us to lose somewhere in the neighborhood of $100 (you’ll hear the whole story later, but for now, bad weather caused us to miss our connection out of Atlanta, which put us into Rome 10 hours late. Unfortunately, I’d only booked the train tickets about six hours after our plane was due to land, so we missed the train (with nonrefundable tickets) by four hours), I hesitated to book too much in advance on the 2015 trip. Even buying the train tickets to Philadelphia made me nervous, and that part of the trip was planned for the Saturday of a trip that started on a Tuesday. Long story short, we walked around Independence Hall and I gave Alex the $0.05 lecture on the significance of the building, but we never actually got inside. Fortunately, I have gotten into Independence Hall. I cannot remember if we got our tickets ahead of time or not, but I suspect we didn’t. This was the days before everyone had Web access in their homes. I do remember that we bought our Statue of Liberty tickets the morning of the trip out to Liberty Island, so we probably picked up the Independence Hall tickets the same day as that tour, as well. For those not in the United States (or for those in the United States who have forgotten their United States history), Independence Hall stands in Independence National Historical Park, which also includes (but is not limited to) other sites such as the Liberty Bell Center, the First and Second United States Banks, and the President’s House, the archaeological site of the presidential mansion from the final years of the presidency of George Washington and the early years of the presidency of John Adams. The President’s House, which was excavated in the early 21st Century (and thus we may have walked right over it without knowing it in 1988), is also a monument to the African-Americans who lived in enslaved conditions in colonial days. Particular focus is put on Oney Judge, who had been “on loan” to George Washington and who escaped from the President’s House on May 21, 1796. Independence Hall was the first capitol building of the United States of America. It served as the meeting place for the Continental Congress. The building is probably most famous for being the site where the Declaration of Independence was signed, though it is also where the Constitutional Convention was held. Originally, the founders passed something called the Articles of Confederation, which lasted for about eight years. When their first attempt turned out to be a big failure, Congress reconvened and passed a whole new set of laws providing for a whole new arrangement for the government, and that is the constitution that the United States of America has today. Independence Hall has changed much over the intervening centuries. They added a clock to the side of the building, then removed the clock, then put the clock back up. They apparently completely gutted the building at one point. The interior that we have today is relatively recent — the National Park Service did a major renovation on the building when they took it over. The project took from 1951 until 1973. I’m looking for pictures of what the building looked like prior to the renovation. 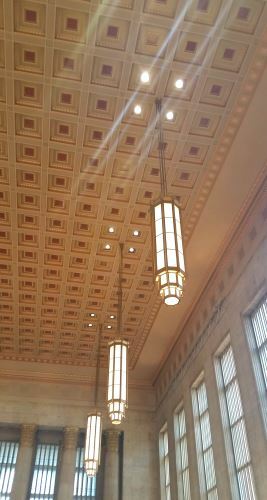 I have a horrible thought that it might have had one of those drop ceilings with the foam acoustic tiles, but perhaps since the renovation started in 1951, the building was spared that indignity, at least. Independence Hall, 1988. You can’t see it, but the Centennial Bell (in the steeple) was ringing as I took this picture). We stayed in a hotel close to Independence Hall while we were in Philadelphia, and so I got used to hearing the Centennial Bell ringing. Knowing that it would be the last time I’d hear that sound for quite a while (it ended up being, what? 27 years? ), I took the above picture as it rang on our last day there. On the tour, they talked about the history of the building, including the renovations. It’s still neat, though, to stand in the building where such important stuff happened. And sure, you’re not standing in exactly the same place as the founders stood when they did their founding, but at least you’re looking out the same windows? Philadelphia is home to a lot of firsts for the United States. It was the location of the first brick house built in North America, it was the first home for the Quaker and Presbyterian denominations, it was the site of the first public library (which was founded by Benjamin Franklin), it was where the first American flag was made, and it was, of course, the first capital of the United States. Philadelphia was also home to the first commodities exchange in the United States. A commodities exchange is kind of like a stock exchange, except instead of ownership in companies, commodities exchanges are a place where you buy and sell things. These things have traditionally been agricultural in nature, coffee, pork bellies, and so forth, but they can also be industrial, such as oil and metal. As an aside, Chicago has a famous commodities exchange, the Chicago Board of Trade, and the Board of Trade building is just lovely. Remind me to get some pictures while I’m in Chicago in August. But I digress. 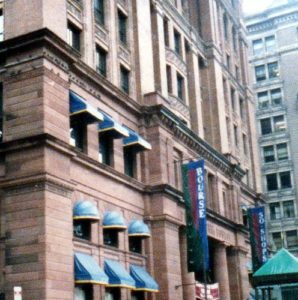 The first commodities exchange in the United States, which, as I said before, was in Philadelphia, was known as the Bourse. The Bourse was founded in 1891 and the building (the first steel-framed building ever constructed) was finished in 1895. After the exchange went out of business in the 1960s, the building was converted into office space, and then the first floors were turned into a shopping mall. I’m not even sure why we went in, but it was a nice place to sit down and get our bearings. I think we got something to eat there, but cannot be sure. They were having a display of costumes from that year’s Mummer’s Parade (the oldest folk festival in the United States), and my mom took some pictures of the interior, but they all turned out really dark and I don’t have the time or energy to make them look professional, so above is a picture showing more or less what the front of the building looks like. I also didn’t remember, until my 2015 visit, that the Bourse was right there on Independence Mall, down the street from Independence Hall (it’s almost like poetry!) and across from where the Liberty Bell Center is now (more-or-less kitty-corner from where the Liberty Bell Pavilion was back in 1988). We took two non-North-Carolina-or-Florida trips in 1979. I can’t remember which came first, though, and the photographs we have were all taken with a Polaroid SX-70, so they are completely undated. So we’ll do the bigger trip first, and then move onto the smaller one later. The bigger trip was Gettysburg, Washington, bits of Maryland (including Barbara Fritsche’s house), Williamsburg, and Jamestown. Because of my parents’ thing about famous houses, we also fit Mount Vernon and Monticello (homes of George Washington and Thomas Jefferson, respectively) in on the trip. The order of that photo album has us going to Gettysburg, then the National Cemetery, then to Mount Vernon, then back to do the rest of D.C. and Monticello after Williamsburg and Jamestown, so that’s probably what I will do here. Gettysburg, Pennsylvania is home to the aptly named Gettysburg National Military Park, which encompasses the battlefield, a national cemetery, assorted monuments, and a visitor’s center. The visitor’s center is home to a museum, a “Cyclorama,” which is a circular panoramic painting, in this case, of the battlefield. The Battle of Gettysburg, which was fought on July 1, 2, and 3, 1863, is thought of as the “turning point” for the Civil War. Up until that battle, the Confederacy seemed to be doing pretty well, Gettysburg ended the Confederacy’s hopes of victory. And, indeed, the war only went on for nine months and six days (by my count) after the Battle of Gettysburg ended. 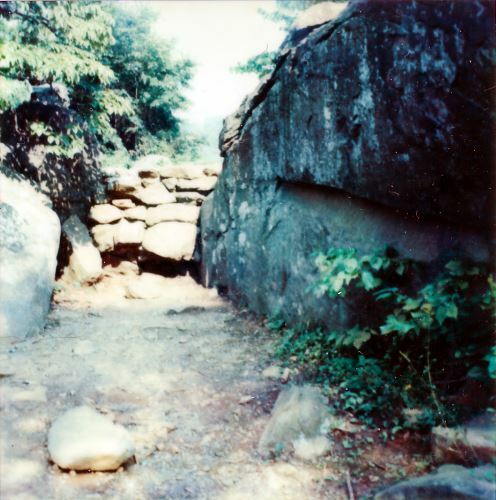 Gettysburg was the bloodiest battle of the Civil War, with over 50,000 casualties. We stayed in town in a hotel next door to the house where the only civilian casualty of the battle, Ginnie Wade, died. Ginnie lived in the center of the town, and she had come to visit her sister on the outskirts of town at the time of the battle. A bullet, either fired by a sniper, or a stray bullet from a nearby skirmish, passed through two doors and hit Ginnie, killing her instantly. I looked at this area on Google Maps and I seem to recall more buildings in that area than there are today. When we visited Gettysburg, there was an observation tower near the battlefield. The National Park has since seized the property under eminent domain laws and demolished the tower. The National Park Service apparently intends to restore the land to what it looked like in 1863, and since the tower had a very 1970s vibe to it (and, indeed, it could not have been built without access to computers to calculate the support necessary to build the tower with the minimum amount of steel), it had to go. Ir’s kind of a pity, though. The tower won an award from the American Council of Civil Engineers and was the subject of patent D227448. The Visitors Center and Cyclorama have been razed and rebuilt in a more 1863-ish style since my visit, as well. The new building looks more like a farmhouse and barn than the old building did. In 2015, Alex and I spent one of our vacation days in Philadelphia. We didn’t get much of the traditional sightseeing done — we didn’t go on the Independence Hall tour or anything like that — we mostly spent time walking around the Central City with a couple that we are friends with. Before we met up with them, we did get a chance to see the Liberty Bell. There was one notable difference from my 1988 visit. The area near the Liberty Bell Center is where George and Martha Washington lived. And the entrance to the Center itself is above the slave quarters. Because of this, the entrance to the Liberty Bell Center now has an area dedicated to Washington’s slaves, with special mention of Oney Judge, who escaped from Philadelphia and lived out the rest of her life as a fugitive in New Hampshire. You see, George and Martha Washington had two sets of slaves. There were slaves that George owned and there were slaves that came from Martha’s first marriage, to Daniel Custis. The slaves that had belonged to George and Martha personally were freed a few years after George’s death. Judge, however had been from that first marriage, and the law forbade Martha from freeing the slaves that came from that first marriage. As a result, for the rest of her life, Judge “belonged to” the heirs of Daniel Custis. 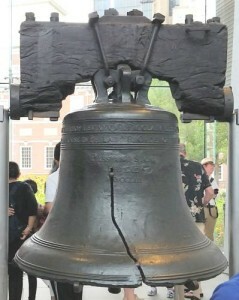 The Liberty Bell was pretty much what one would expect. A bell with a inexpertly mended crack in it. But it’s important in the scheme of American history (which will be the history course for Alex’s junior year of high school, so it is worth the photo op). In keeping with the current social climate, lots of people were taking selfies with the bell. After a bit of confusion as to which side of Independence Hall was the front, we met up with our friends, and spent the rest of the day with them. We went to lunch at Reading Terminal. We ate outside, which is a long tradition with us when we eat together. I can only recall one or two times that we’ve eaten indoors. Then we wandered around the Central City, with a stop at Spruce Street Harbor Park where we sat and talked for a while. Alex took pictures of the ships that were docked in the harbor. We also had water ices; Alex liked his so much that he bought a second one. We walked around the center city some more after the park and on the way back to 30th Street Station, we stopped at Washington Square Park, which was home to one of the moon trees, a sycamore. The original tree died and a new tree, a clone of the original, was planted in its place. It was reading up on Washington Square Park that led to my earlier post on moon trees. It was wonderful seeing our friends again and seeing their new home. And the things we saw during our day in Philadelphia made me wish that we’d had more time to spend.